A week after Olmert admitted to hospital with chest pains, former Prime Minister discharged and returned to Maasiyahu prison. Former Prime Minister Ehud Olmert was discharged from Sheba Hospital in Tel Hashomer in Ramat Gan Tuesday and returned to Maasiyahu prison in Ramleh to continue serving his 27-month sentence. Last week, Olmert was rushed to the hospital after he complained of sharp pains in his chest. The parole board is scheduled to rule on Thursday on his application for early release from a sentence for corruption while mayor of Jerusalem. Olmert is under investigation for sensitive documents found following an attorney's recent visit. 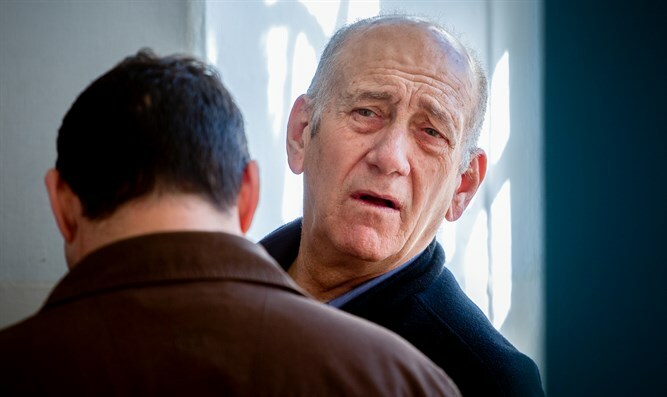 The prosecution claimed that the possession and distribution of the classified material - which was intended for inclusion in Olmert's autobiography, is a disciplinary offense which proves that the former Prime Minister is a prisoner who is not worthy of receiving an early release from prison.